Our Business to Consumer (B2C) shopping cart was built with a focus on usability and provides the best shopping experience possible. Our technology reduces shopping cart abandonment and yields a high visitor/order conversion rate. Results of this technology are best illustrated by merchant testimonials. You are about to visit FirstFairway.com, a fictitious online golf retailer. Although only golf clubs and accessories are sold here, virtually anything can be sold with the Nexternal eCommerce Platform. At FirstFairway you will see an example of how our software can integrate with your website and witness all of the benefits listed above. 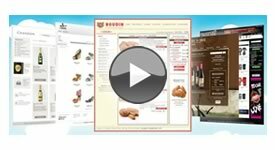 After you have completed looking at the store and placing a sample order, please visit the Order Management System to see the full toolset provided to merchants.